Wubba Lubba Dub Dub!!! Everyone’s favorite dimension-hopping, Blips & Chitz-loving malcontents are coming to Rocket League in our 2nd Anniversary Update! Thanks to our friends at Adult Swim and Adult Swim Games, Rick and Morty (with friends in tow) will be available as FREE customization items starting on July 5. Rick and Morty will be available as Antennas, along with ‘Cromulon,’ ‘Mr. Meeseeks,’ and ‘Mr. PBH’ Toppers, an ‘Interdimensional GB’ Rocket Boost, and some familiar-looking ‘Sanchez DC-137’ Wheels. 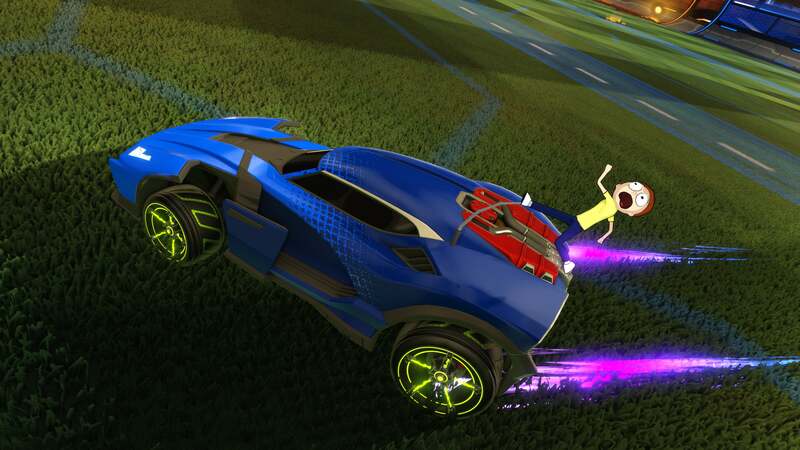 Bonus: the ‘Cromulon’ Topper can drop as a Painted item! Look for these new items as Common drops after offline and online matches. (Szechuan sauce not included.) Check out the GIF below to see all the items in action! Ps. The Anniversary Update drops today at 3pm PDT/10pm GMT, 12am CEST. Competitive Season 4 will end approximately one hour before the update.